Hello, stranger! It seems like you’re planning to visit Balkans! 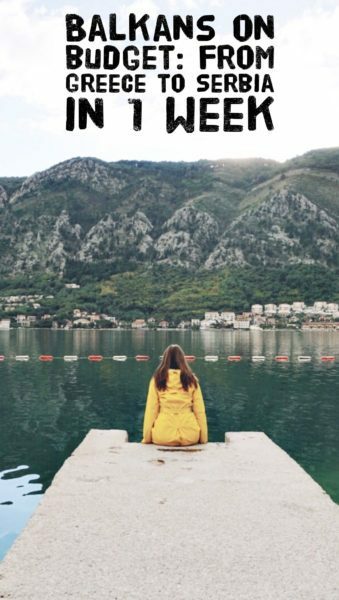 If so – this post is actually the second part of the massive Balkans on a budget post, where I tell you about our backpacking adventures from Athens to Belgrade. If you need information on trip planning, transport & schedules, head to the first part that is available HERE. So, Backpacking in Balkans isn’t as tough as it seems. As I already mentioned in the previous post, we only had one week (or 8 days to be precise) for this trip and wanted to see as much as possible. The road trip around Balkans wasn’t feasible because of scarce car rental opportunities, so we went for the buses and trains. This way, it was possible to travel Balkans and immerse in the life of the region: for example, in Serbia, we took a very narrow local road through many villages and saw how do the people live there. Same in Albania and Bosnia and Herzegovina. We learned a lot from this travel Balkans trip and would like to share it with you. Athens, the very famous capital of Greece, welcomed us with long queues at the passport control and amazing for October weather – 25 degrees Celcius. Since I traveled to Athens from the city where it was already 0 Degrees Celsius at this moment, I felt like I returned back in summer. Getting from the Athens airport to the city center on the cheap (Omonia Square) was a challenge. There was an express bus, which would take us to Piraeus, but that didn’t sound great because walking for 50 minutes with a huge backpack when it’s hot outside wasn’t really appealing. The bus we needed had just departed, so we had to wait for a lot of time. Instead, we took a metro train to Syntagma square for 9 euros per person and arrived to the city centre in less than one hour (that was expensive since we only had about £60 for both of us per day and still needed to eat, do sightseeing and pay for transport). The train goes at the M3 line every 30 minutes and takes around 46 minutes (to Syntagma). The metro of Athens is full of people asking for money: from refugees to disabled people (some totally burned and without arms and legs, which looks very disturbing) and gypsies playing musical instruments and carrying always sleeping babies. From Syntagma we walked to our hotel, Epidavros, located close to the Omonia square. The hotel was one of the cheap hotels in Athens (our backpacking budget for Balkans was really low) and we paid it entirely with travel miles. So yep, we didn’t pay for the hotel at all. The location was really good in terms of closeness to Acropolis and bad in terms of the district itself. Seems like the immigrant crisis hit Athens really hard because the whole district was full of refugees. Everything was really dirty and sketchy, people were staring at us not exactly in a friendly way and for the first time, I felt happy that I was wearing long black pants and not a short dress. Didn’t expect that to happen in Athens. I mean, I really feel sorry for these people, but when it gets dangerous to walk there… that’s already a problem. So we remembered the zone and decided to avoid it at any price. Our advice: don’t walk from Omonia to Acropolis using the Medandrou street. 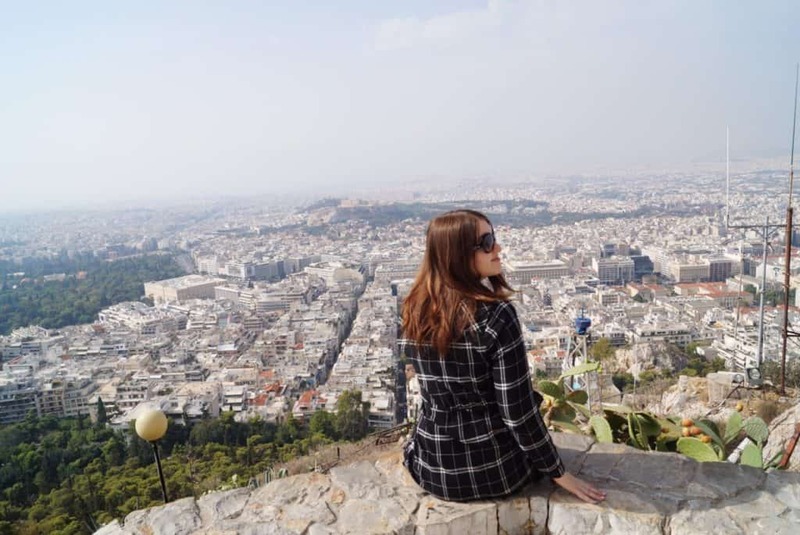 Acropolis of Athens is quite expensive to visit: the ticket costs 20 euros and if you want a combo ticket which allows you to visit more spots, it would cost you 30 euros. 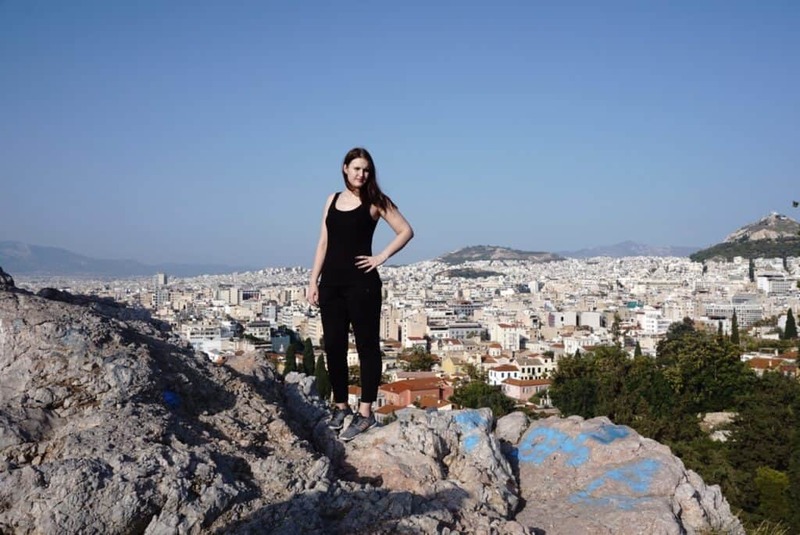 If you’re staying in Athens longer, I would recommend you to buy a tourist pass (it would save you money, if you want to do a lot of sightseeing). The best view of Parthenon you won’t find inside the Acropolis, though – you need to go to the Acropolis museum. Also, the Parthenon is visible from the Mount Lycabettus (on the photo above) as well as the incredible panorama of the whole city. You can walk up to the mountain for free, or take a funicular for 5 euros one way (in this case, even though we were backpacking in Greece, we paid for the tickets). Prices in Athens: is Athens cheap? The prices in Athens are okay, but it’s better to stay outside the most touristic places. For example, a gyros on the way to Acropolis would cost you 9 euros, but the same gyros you can eat in Omonia for 3.90 euros. And in the Arab district, it’s even cheaper – 2.5 euros. A day menu including a salad, main dish, dessert and a glass of wine would cost you from 11 to 17 euros in a restaurant in the city center. 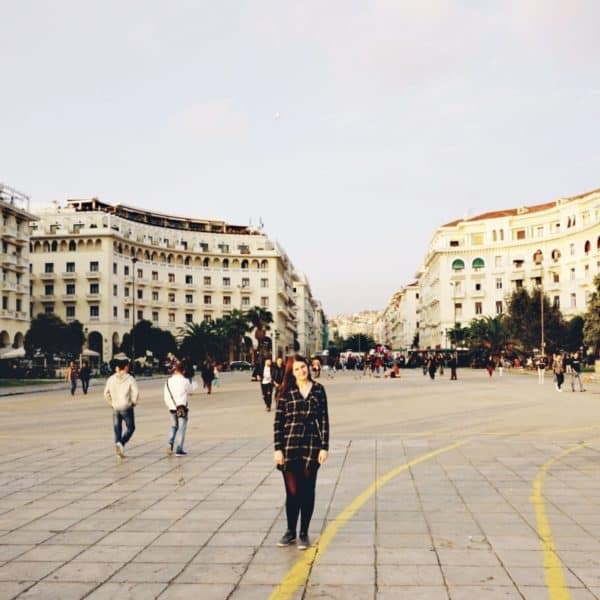 The next stop in our travel Balkans trip on a budget was Thessaloniki. We got from Athens to Thessaloniki by plane and took a bus 1B to the city centre (unlike Athens, this bus was quite cheap – around 2 euros). For the flight, we also paid with travel miles. Thessaloniki was really a surprise for us. Nowhere on the internet, it was described as a beautiful city worth visiting, but we actually liked it a lot. Maybe there isn’t much to see in the city except for the fortress and the tower on the promenade, but the main square is also impressive. In some parts, Thessaloniki really resembles Nice, France. Also, Thessaloniki is a really walkable city full of nice cafes and restaurants facing the sea. All the bars were really full at night because Greeks like going out for a coffee and enjoy the evening and chat with friends for hours. Also, Thessaloniki is a city of bakeries there was a bakery literally every 10 meters: the Greeks really take them seriously. Also, the Greek sweets looked extremely delicious! We bought a cake and it was marvelous 🙂 Thessaloniki is a perfect stop in a backpacking in Balkans itinerary! We stayed in the Olympia Hotel Thessaloniki and loved our stay. Again, it was free for us (this time it was British Airways Miles) and everything was great there. The next morning we were leaving the hotel very early, so they prepared a nice breakfast box for us. Since we spent just a few hours in Thessaloniki, we couldn’t see much, but the promenade and the tower, but that left a really good impression of the city. Moreover, Thessaloniki is significantly cheaper than Athens, so staying there during a backpacking in Balkans and Greece was a good choice. In the previous part of travel Balkans, I’ve already explained why we didn’t choose the easier option of getting to Ohrid from Thessaloniki through Skopje – we simply didn’t have time for that! So we bought a ticket to Florina (a city on the border with Greece) and took a taxi from there to Bitola. That was probably the most expensive journey in our entire trip and we paid something like 40 euros! But we had to. Crossing the Greek – Macedonian border in a taxi was really fun, besides, the border officer even spoke Russian – very random for a tiny border in a really uncrowded place. Our taxi driver referred us to the other driver he knew who would take us to Ohrid for as low as 10-15 euros. That was ridiculously cheap for a drive of 1 hour. We went to walk around Bitola for a while: the city was tiny and nice and very authentic. We were the only tourists in the city, so the locals, who were sitting on the cafe terraces on the sides of the street were observing us and some were even asking where are we from. However, even in Bitola, the waiters in this cafes spoke English, and that surprised us a lot! Macedonia also surprised us with the diversity of the population: there are Christians and Muslims living happily together (well, I can’t say how happily, but it seemed nice to us), and there are orthodox churches standing next to the mosques. Actually, the same thing happened also in Albania and Bosnia and Herzegovina, as we discovered later. When we got to Ohrid, we were really surprised by the beauty of the place and so few tourists it had! Maybe it was the low season or the difficulty to get there. I feel like many people just are scared off by the complexity of the route to get there. And in order to get to Ohrid, you need Either to travel from Skopje (which is not the top destination either) or buy a tour. Only if you really want to get there, you’ll do something like we did. But I can assure you that it was worth it, Ohrid is a must! We stayed in a very special and authentic Jovanovic Guesthouse and the hosts were really kind and sweet! And the location of the guesthouse was great, too. 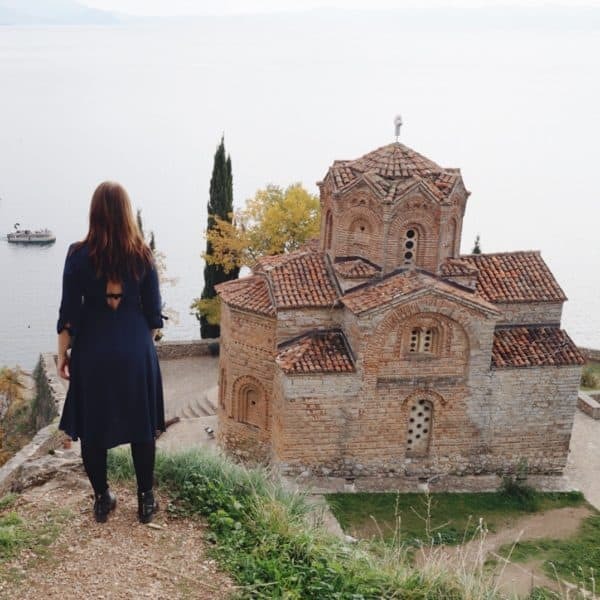 In Ohrid town, you can visit the famous Sveta Sofia church (we had a view over this church from the apartment) and another church, which appears on all the photos of Ohrid. It can be followed by a really nice walk through the forest in order to get to the Fortress. There is not much to do in Ohrid town, but during the high season you can just relax and swim in the lake. During the low season, however, there isn’t much to do: the weather in Ohrid in October was around 18 degrees, still warm but not warm enough for swimming. That’s why we only stayed for a day there. The prices in Ohrid are really cheap compared to Greece: we had a lunch in a very centric restaurant with bowls of soup, a salad, and a huge main dish plus two beers for less than 11 euros in total. 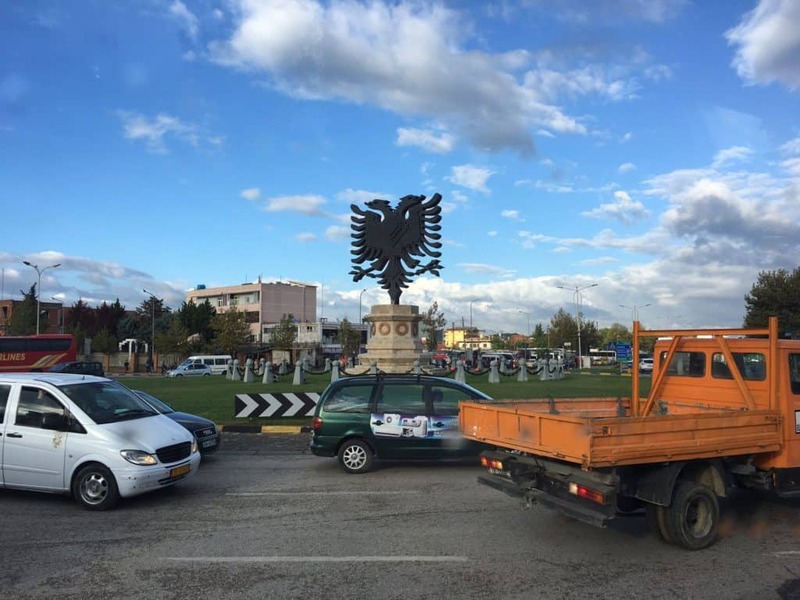 Next destination of our backpacking in Balkans trip was the capital of Albania – Tirana. It wasn’t possible for us to get from Ohrid to Tirana, so we had to go to Strega, a town nearby, and take a regular bus from there. Getting from Ohrid to Tirana isn’t so easy. In Struga, there were only two regular buses from Struga (Ohrid) to Tirana: at 9:30 am and at 12 pm. We took the earlier one since the indicated duration of the ride was 1.5 times less – just 4.5 hours. The landscapes of Albania were really beautiful – Albania surprised us a lot. I expected something poor and not much developed, but even the countryside of Albania looked okay. Seems like there was a lot of investment recently. The capital of Albania, Tirana, is a really quiet and green city. The facade of the city is nice, but if you turn somewhere from the bug avenues, you’ll see something really creepy. That’s where our hotel was located. We stayed in the hotel Idea and the location of it was perfect (few meters away from the bus stop, from where the international buses depart and where they arrive, too). Apart from that, the room was more or less okay, though it smelt like smoke all the time. It wasn’t cheap, but we didn’t want to risk it in Albania. Also, walking there in the evening felt more or less safe, so we didn’t worry much. The main square of Tirana was under reconstruction, so it wasn’t possible to take some nice shots of it. There are only a few landmarks of Tirana, which are worth visiting. 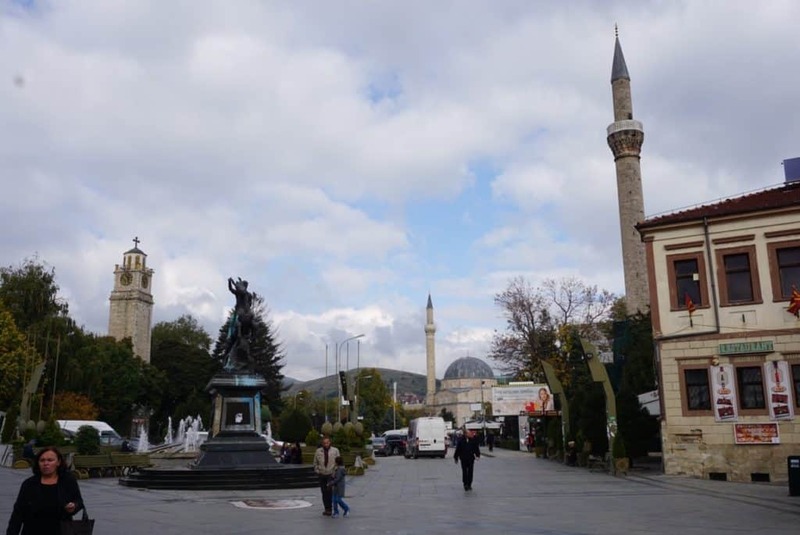 One of them is the main square along with the Mosque and a huge orthodox church on the right side of the main square. The church is very modern and looks interesting inside. Another landmark is the Pyramid of Tirana, which, however, isn’t open to visitors and is in a really bad condition. Finally, there’s a nice park in the heart of Tirana with a huge lake in the middle of it. We visited this park in the evening and it was really crowded, looked like all the Tirana came there to run. In Tirana, there are only a few of international food/clothing chains present in the city (like KFC or Adidas) and most of the shops and restaurants are local. We had lunch in a great pizzeria Era, which serves Albanian specialties apart from the Italian cuisine. 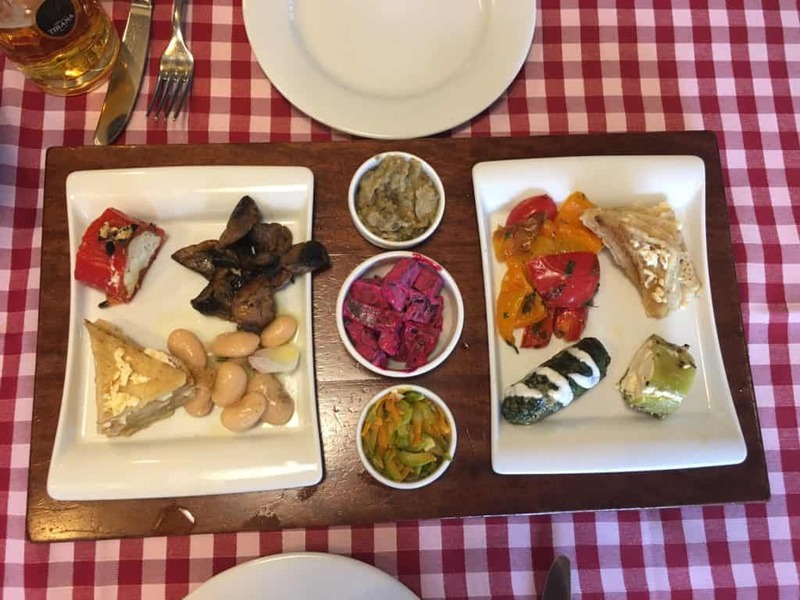 The prices were very friendly and the food was tasty and well presented, so well, in case you’re choosing where to eat in Tirana, head to Era. To summarize, Albania left a good impression. Seems like this country is developing very fast and well, in some years it could become a nice travel destination. Tirana, however, won’t be a touristic place anytime soon, since there’s not much to do. Moreover, there are many beggars on the streets of Tirana and these beggars are very different from the beggars in any European city: we had a well-dressed man coming to us and asking us in English about where are we from, offering us a tour in the closed Pyramid of Tirana and when we said no, asked us for money to feed his family. Later, a boy approached us in a cafe and he started begging for money on his knees. This way of asking was very unusual for me and of course, we helped him. That happened despite the fact we had backpacks, were dressed in cheap clothes and didn’t look like people who you’d ask money from. Our backpacking bus/road trip through Balkans continued in Kotor. We booked a trip to Kotor from the Kotor – Tirana bus service. The trip took a bit more than 6 hours but the way was really beautiful, so we didn’t complain. The bus goes through Shkodër (with a 40-minute stop, so you can see the city a little bit), Podgorica, Budva and finishes the journey in Kotor. The part of the route from Podgorica to Budva is especially beautiful: amazing high mountains and then, after 2 hours, the sea is finally visible. Choosing between Budva and Kotor was hard, but in the end, we didn’t regret choosing Kotor. Budva might be better in summer, and for much longer time, but we only had 4 hours and wanted to see something special. The old town of Kotor is just incredible. It’s small but really remarkable. There are plenty of hotels and shops inside the fortress, but there are also locals living there and that’s really unique. However, eating in the middle of the Old Town of Kotor is a bit pricey, so we walked outside, passed a tiny shopping mall and headed to the beach, where the rest of the restaurants are located. There we found a really nice place with affordable prices: a grilled fish was just 8 euros and it was delicious and huge! 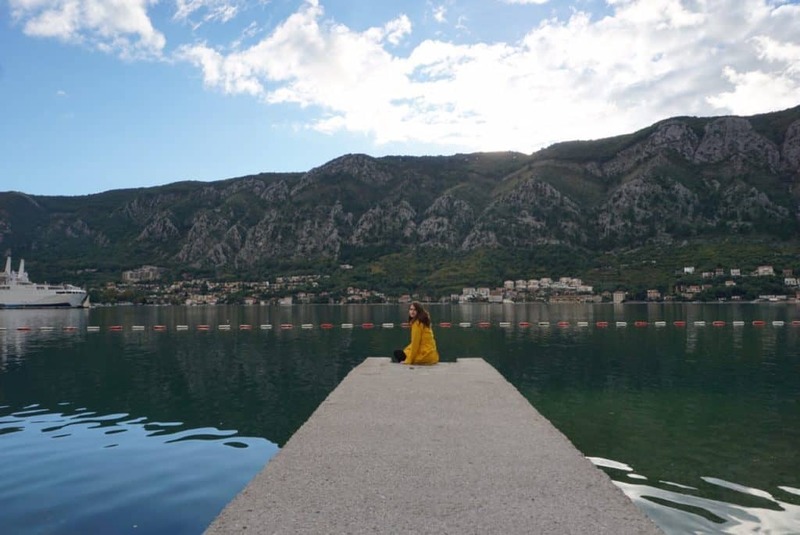 Kotor is great for walking: there is a very nice embankment near the sea, where everybody is walking and chilling but apart from that and the Old Town there is nothing to do in October. If we stayed for more time, we would have gone hiking or went to some town in the neighbourhood, but doing that within just 4 hours was impossible. Dubrovnik was the next stop of travel Balkans trip and it was the reason why we only had 4 hours in Kotor: we wanted to see Dubrovnik at night so badly! And when we saw it, we didn’t regret: Dubrovnik is one of the most beautiful cities we have ever seen (and we’ve seen many, believe me). It was already 9 pm when we got to the main Bus station. From where we had to take a bus to the Old Town. The bus ticket price is 12 Kuna which makes 2 bus tickets already close to the Uber price of 5 euros. Nonetheless, we took a bus and went to our hostel in the Old Town of Dubrovnik. The hostel’s name is Hostel Angelina Old Town and it’s located literally on the top of the city, meaning you either have to enter the city from the Northern Gate and climb up using the local highway or climb a lot of stairs in the middle of the Old Town. We didn’t have any heavy suitcases (only two backpacks), so we decided to climb up, which nevertheless was quite tough. Hostel Angelina was literally one of the cheapest accommodations with private rooms in Dubrovnik (we wanted a private room, as I can’t fall asleep in a dorm). As for the city, Dubrovnik is wonderful. Like really wonderful. Despite the fact that it’s expensive and crowded, it’s a must. Even in October, visiting Dubrovnik was enjoyable. 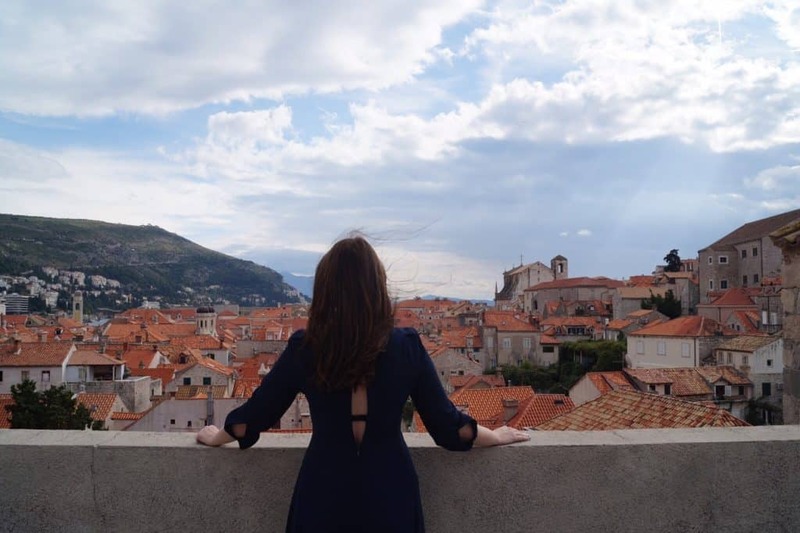 The weather in Dubrovnik in October was 19 degrees, so wearing a long dress was perfectly possible. I had a very nice medieval (Game of Thrones inspired) photo session in mind and we managed to take some really nice shots. However, the weather in October is really unpredictable and it rained 3 or 4 times, and by ‘rained’ I mean showers. All the people who were on top of the Dubrovnik wall (just like us) were literally trapped and had to run to some constructions, which would cover them from the rain. Some just left the wall and went to some restaurants. The tickets to the wall of Dubrovnik are quite expensive: 120 Kuna, which is 15 euros, but they also include the entry to some Cathedrals and to the Fort. Our budget of £60 per day was shrinkin minute by minute. 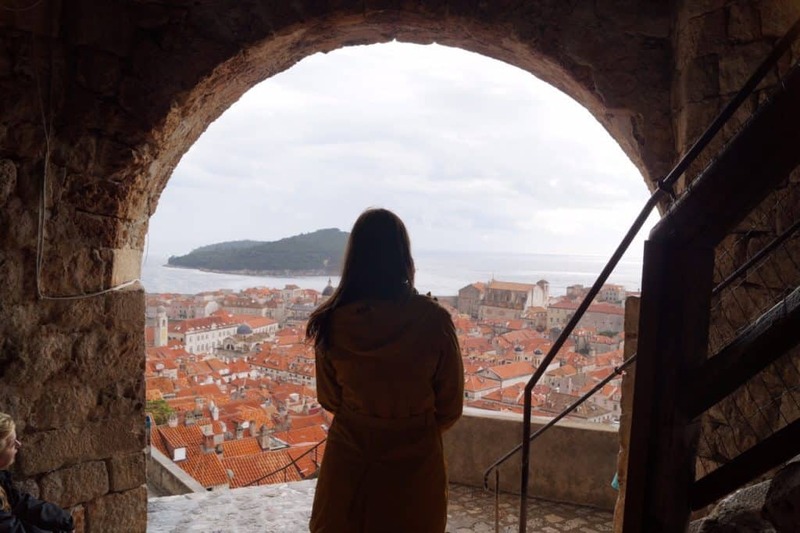 In case you’re buying that ticket, I would recommend you to visit the fort, since the views from there to the Old Town of Dubrovnik are really remarkable. If you’re staying in Dubrovnik for longer than 2 days, it makes sense to buy a Dubrovnik Card: it costs 170 HRK for a day or 225 HRK for 3 days. There’s also an option for a week, which costs 350 HRK. The card includes the most historical landmarks like Dubrovnik City Walls, Franciscan Monastery Museum, many museums and the public transport and also some discounts for many of the restaurants & travel agencies. Food in Dubrovnik was also very pricey, so we overspent our budget by £50. Backpacking in Dubrovnik is very hard, as you can see! From Dubrovnik to Mostar, the next destination of our Balkan road trip, we took a bus, which we booked at croatiabus.com. We arrived in Mostar already in the evening (around 8pm) and headed directly to the Elite Guesthouse. The host, Meša was really kind: he gave us an amazing private room with jacuzzi and some treats like croissants and cookies. Moreover, he gave us a brief overview of the Herzegovina region and Mostar, drew on a map all the places we have to visit and even recommended us a nice restaurant. No wonder his place has a rating of 9.8! That was officially the highest rated place we’ve ever been to! Mostar at night was adorable. Especially the famous bridge of Mostar. At night it wasn’t crowded at all (on the way back from the restaurant it was completely empty) and as you maybe know (or have heard of), during the day it’s full of tourists, especially from China, who occupy the bridge completely, so it’s not possible to either walk to take any picture. The restaurant was nice too. For Balkan standards, It wasn’t cheap, but compared to Dubrovnik, it was almost nothing. For main 2 courses and 2 glasses of wine, we spent around 26 Bosnian marks, which is around 13 euros. Just to compare, a breakfast in Dubrovnik (in a very budget place) was 18 euros. So backpacking in Mostar was definitely more feasible that in Bosnia & Herzegovina. Just as we thought, during the day, Mostar was really crowded. However, it was way livelier than at night, since all the stalls transformed into souvenir and local goods shops or restaurants. Souvenirs in Mostar are really nice and affordable but most importantly, they are unique. Last time I’ve seen something similar to the souvenirs in Mostar was a couple of years ago in Turkey. We went to see the bridge from the best spot recommended by our host and had to wait there for a while because the spot seemed to be famous. From where you can see the locals jump from the bridge to water for some money collected from tourists. These jumps are very impressive, but if you want to take a photo, you need to pay, because the locals collecting money can be quite aggressive. Later on, we discovered another spot great for photos and stayed there for a while. Apart from the bridge and a couple of museums, there is not much to do in Mostar. The modern part of the city isn’t nice looking, so walking there doesn’t make any sense. 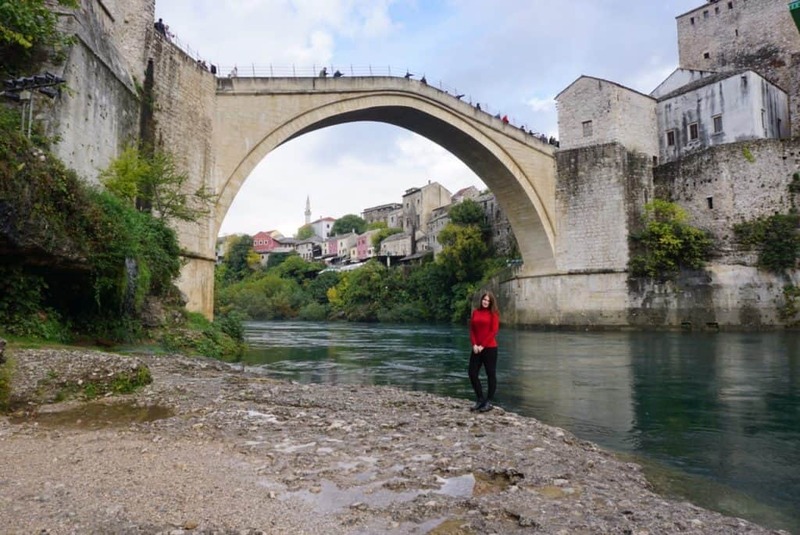 However, if you’re staying in Mostar for a couple of days, you have a chance to discover the nature and architecture of Bosnia and Herzegovina. Not far from Mostar, maybe 1 hour away, there are some really impressive landscapes, so I would recommend you going there. Again, we had just a few hours in Mostar on the next day and had to take a bus to Sarajevo at 3pm. Surprisingly, this was the only bus during our travel Balkans trip, which was really full, so full that some people were standing, so it makes sense coming to the bus stop in advance and queue, so you can get a seat in the Mostar to Sarajevo bus. Next stop of our Balkan road trip was Sarajevo. When we arrived in Sarajevo, it was already getting dark. We bought our tickets to Belgrade in the ticket office and went to the tram stop to catch a train to the old town. The tram arrived only in 40 minutes, so when we got to our hostel, it was already very dark, so we didn’t see the city during the saylight at all. Our hostel Franz Ferdinand was located in a very centric place. The room looked new and huge and was really nice. So the hotel experience was very nice. Unfortunately, when we left the hotel, it started raining very heavily, and the rain didn’t stop even after dinner. We were trying to walk around and go to one of the bars, but not only they were extremely crowded (well, I guess because of the weather and the fact that it was Friday night), but also it’s permitted to smoke in bars/restaurants in Sarajevo, so it wasn’t possible to breathe. It’s been a while since I saw a country where it would be permitted to smoke inside the restaurants. I personally find it very uncomfortable and unhealthy and moreover, I can’t stand the smoke, so going out clearly wasn’t an option for me. Since we had a bus to Belgrade at 6am, we went to the hotel quite early in the evening and took a taxi in the morning. The bus ride from Sarajevo to Belgrade took more than 8 hours and was really tiring. Finally, the last stop of our Balkan road trip was Belgrade. We arrived in Belgrade around 2pm and immediately went to our hostel to get changed and go out to see the city. The hostel where we stayed is located just 10 minutes walk from the city center. I wouldn’t say it’s in a nice zone, but it didn’t seem creepy or sketchy, and that was already enough for us. The hostel’s name was Home Sweet Home and it was quite weird: a huge flat with multiple rooms and 2 bathrooms. There was also a huge living room, which was always full of people and in the evening there were kids running around in that flat. Not the best experience, I would say. But again, for 25 euros for a private room, I’m not complaining. We had zero expectations for Belgrade, but it happened to be a really nice city, somewhat resembling Vienna in its city center. Belgrade is not such a touristic place because there are not many famous landmarks and there’s not much to do during a couple of days, but at the same time, it’s quite hard to reach. Reaching Belgrade can take many hours (remember our 8+ hour bus ride). Backpacking in Belgrade was easy because of low food prices and cheap hostels. 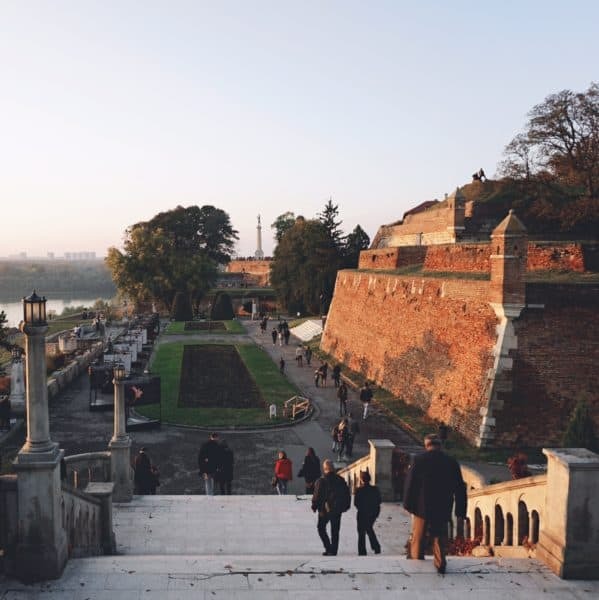 In the middle of Belgrade, there’s a beautiful fortress, where lots of people gather in the evening to just walk and socialize and watch a beautiful sunset, I guess. The sunset was really impressive, so we enjoyed that too. On the main walking street of Belgrade, there are many nice shops and souvenir stalls, most of them were selling T-shirts with Putin and T-shirts saying that Russia and Serbia are friends or something like that. So well, after seeing a huge photo exhibition of Russia and Moscow near the fortress, the friendship between Russia and Serbia was already a fact to me. After watching the sunset, we walked all the way to the Sava Temple – the most impressive church of Belgrade. Unfortunately, inside it was under reconstruction. Later on, we went to watch a movie in a centric cinema. The size of the screen, however, was disappointing – it was more like a TV. But a good thing that the movie was shown in English with Serbian subtitles, otherwise we wouldn’t have been able to understand anything (especially, Pepe). We had our return flight on Sunday around noon, so we decided to take a bus shuttle to the airport. The closest stop was just 10 minutes walking away, in front of the Belgrade Railway station. We checked the schedule and the bus was about to arrive, but we were approached by a taxi driver, offering to bring us to the airport for 800 dinars (the bus tickets would have been 600). In the end, we managed to negotiate the price to 600 and the taxi driver found another person to fill the taxi, so we went to the airport with comfort (such a nice end to the backpacking in Balkans trip). In case you’re wondering how to get to the airport, you can do the same: wait for the bus and if there are taxis willing to bring you to the airport for almost the same price, you could take them. To summarise, the itinerary of our Balkan trip was almost perfect in terms of sightseeing as meeting many cultures. In case you don’t have much time, but you want to see as much as possible, you can take and change a bit our route. However, if you have plenty of time to travel Balkans, like a month, for example, you should definitely stay longer in Greece, Montenegro, and Croatia. Also, our plan was just fine in October, because in some places like Greece and Albania it was still very warm, however, for Sarajevo and Belgrade we needed proper autumn clothes. It was definitely easier to travel Balkans by buses and allowed us to buy some tickets last minute. I’m saying that because not only travelling by buses is more challenging in summer (remember, that not all of them have aircon), but also everything is far more crowded in summer and some buses might be sold out in advance. We didn’t encounter any traffic on the way from Albania to Montenegro and from Kotor to Dubrovnik, but usually, this road is just packed with cars in summer. I would recommend you checking that routes very carefully. As for the budget, we had around £60 per day for our backpacking Balkan road / bus trip (excluding accommodation) and everywhere except for Dubrovnik and Athens, it was enough. So travelling Balkans trip on a budget is perfectly possible! Should you have any questions, feel free to ask! 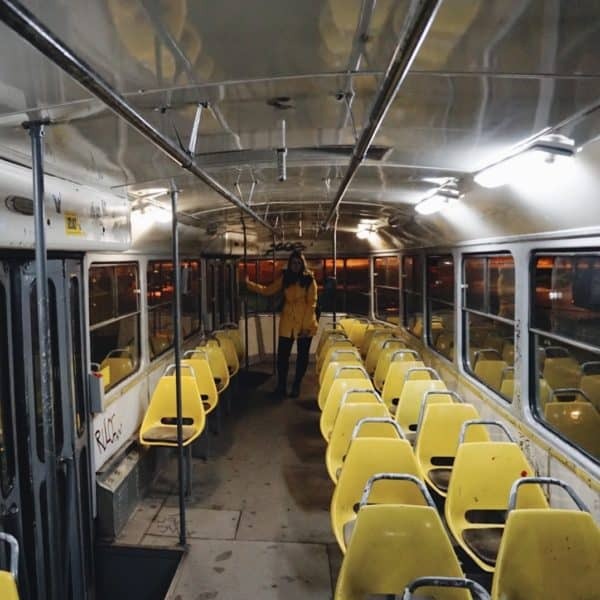 And don’t forget to check out the first part Balkan trip on a budget about the transportation and how did we book everything. Also interested in visiting Romania? I’ve got a post about Romania for you! Yes, the trip was totally crazy 🙂 Thanks a lot for your comment and I hope you will visit many of these places! I have all these countries on my wish list. You did get to see a lot of places in such a short span. I didn’t know that it would cost you around 30 Euros to visit the Acropolis. Dubrovnik is high on my list. Now that is a fantastic travel guide, exactly the stuff I like to read about. I really enjoy an article that actually gives me the real experience instead of tourist dreamy stuff. Well done. Thanks a lot! 🙂 Oh I hope you enjoyed Dubrovnik and will enjoy all the other places you will visit! I love the Balkans, and Greece (who doesn’t? ), your post brought a nostalgic smile to my face 🙂 And it is so wonderful to travel with your other half and have somebody to share all that beauty and ugly with, isn’t it? Wow, you covered a lot of ground in a week! I appreciate your honest assessment of your trip – the good and the bad parts. I am anxious to visit Greece and Macedonia, so I will definitely be pinning your article for my future travel planning! Wow! That’s a whole of wonderful places you’ve been. I am hoping to do my own next year when I move to Europe. Crotia especially since I am Game of Thrones fan 🙂 Beautiful snaps by the way! Great overview of your trip. The Balkans are a wonderful, friendly and lively place to visit. I always love spending time there. This is a great guide for any budget travelers to use. I would absolutely love to do a Balkans trip. It looks like you were able to see and do a lot despite your short time there – you must have been exhausted by the end! WTF, you didn’t visit Bulgaria? Crazy miss.